Home / Time to start Cooking with QuiBids! What’s the Cooking with QuiBids contest? Once again, we want to know what’s going on in our customers’ kitchens! QuiBids sells loads of cooking appliances and kitchen accessories, but once they get squirreled away into your hearths, we rarely —if ever— get to see what goodies you use them to fix. Bread makers and woks are nice and all, but not what really matters is what you prepare out of them! So like last year’s contest, Cooking with QuiBids is your chance to share a recipe with us and to hear what other QuiBids customers are fixing up in their kitchens. You have until November 15 to submit recipes, and on November 16 a panel of QuiBids employees will pick the ten best ones. You will then have until November 23 to vote for your favorite recipe! 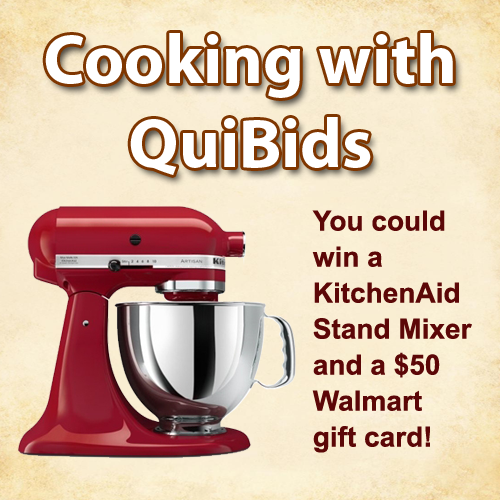 The entrant whose recipe garners the most likes on the QuiBids Facebook page will receive a KitchenAid Stand Mixer (QuiBids Buy Now price: $350.00) and a $50 Walmart gift card (QuiBids Buy Now price: uhhh… $50.00) for their awesome recipe! Visit the QuiBids Facebook page (be sure to like QuiBids on Facebook if you haven’t done that already!) and check out our Cooking with QuiBids contest app too fill out the basic entry form. Part one’s all the simple stuff: Name, QuiBids username, email, DOB, etc. Part two is the crux of the contest. You enter your recipe’s title, an image of the dish, all ingredients necessary to create it, and a step-by-step walk-through for preparing it. While we’re at it, here are a few tips on submitting your recipe well, and thereby increasing your likelihood of winning this contest. 1. You’ve got one photo, so make it good! Our culture values visual representation, so the more enticing you make your dish look, the more votes it’s likely to get! Maybe consider visiting our Camera & Photo section to help out with that? 2. Dummy-proof your preparation instructions. While we’re sure we’ve got a handful of Emeril Lagasses who shop with us, not everybody (this culinary-inept blogger being among the foremost) knows their teaspoons from their tablespoons. Write your instructions out step-by-tiny-step, explaining precisely how to prepare your dish. If you use a specific brand of ingredient, mention it. Measurements should be as exact as possible, and it never hurts to include what equipment is necessary too. There’s nothing worse than being halfway through preparing a meal when you realize you can’t finish it because your cooking sheet is half the size it needs to be. 3. Write so your dish entices! Get people excited to try their hand at your recipe. Use strong verbs (“simmer” instead of “let cook”) and descriptors (“succulent” instead of just “good”) to convince your fellow QuiBids customers that you’ve got the best dish around. -Cooking with QuiBids is open to customers in the United States, Canada, Australia, and the United Kingdom. -Official rules are listed here, divided up by country. -It’s easy to invite your friends! Tell them what’s up via Facebook! QuiBids loves when you bring your friends! -Keep checking in with QuiBids’ Facebook page for updates! Good luck to all our chefs and as always, happy bidding!